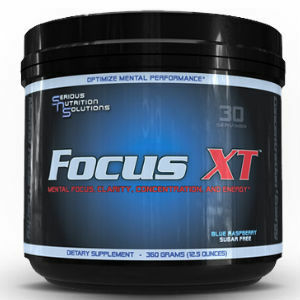 The purpose of this review is to analyze the Focus XT supplement manufactured by SNS. This dietary supplement is supposed to boost concentration, mental focus and overall energy. It is also advertised as a remedy for stress, lack of endurance and motivation, while increasing the ability to sustain intense physical effort (such as training sessions) for longer periods of time. Read on to find out more about this product and about how and if it actually works. Please note that this product also contains both natural and artificial flavors, sucralose, silicon dioxide and FD & C Red 40, which means that it’s not exclusively made with natural ingredients. Nitrovit is a dissolvable powder which has the recommended dosage of two servings per day. Customers are supposed to mix a scoop of the powder with 8 ounces of water or any other non–alcoholic drink and serve it with 10 to 30 minutes before the time they want the effects to begin. The label advises on taking the two daily servings at least 6 or even 8 hours apart, preferably one in the morning and the other one in the afternoon. Although not being clear on the side effects, the manufacturer advises against the consumption of the supplement by pregnant or nursing women. The two daily servings are also not to be exceeded. The price of a Nitrovit container which is said to have exactly 30 servings is $39.95. Unfortunately, there are no discounts or monthly subscriptions available. This is bad news for customers who wish to purchase bigger quantities. After thorough research, we were not able to find any piece of information regarding a guarantee offered by the manufacturer. There are no details about the return policy, refunds or even transportation fees. Apart from that, the customer reviews are scarce and don’t seem to be left by actual customers, but look more like sales pitches. This is one of the main reasons why we believe this product is somewhat questionable. The bottom line is that this supplement is easy to take and it also has a pleasant taste. Despite the fact that it is indeed quite affordable, it still has no available discounts and the lack of a guarantee definitely made us question its effectiveness. Apart from that, customers should keep in mind that this dietary supplement also has artificial additives which can’t be healthy. Henry Costa	reviewed SNS Focus XT	on November 16th	 and gave it a rating of 2.